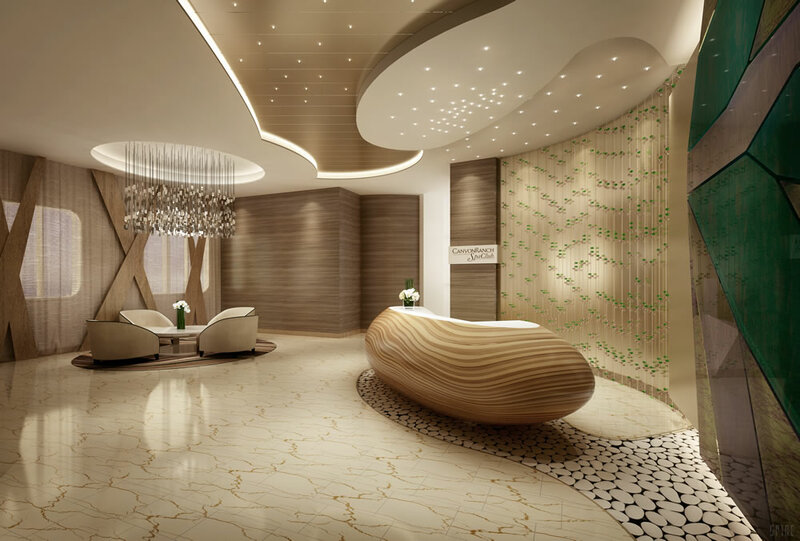 Regent Seven Seas Cruises has revealed details of the lavish Canyon Ranch SpaClub that will be installed on deck five of their latest cruise ship, Seven Seas Explorer. The Canyon Ranch SpaClub facility will be designed as a pampering retreat and will feature calm, serene interior décor. The reception area will be decorated with criss-crossing light-grained wooden bands. Decorative light fixtures will compliment an abstract Swarovski crystal sculpture, which in turn will form reflections on the marble floor. Heated loungers with contoured seating surfaces will be available in the treatment foyer. Eight treatment rooms will be installed as will a thermal suite, complete with a state-of-the-art infra-red sauna, an aromatic steam room, and a cold room constantly set at 12ºC. A shower room will enable guests to choose from a variety of pre-set shower treatments with various distributions of water flow, chroma-therapeutic lighting and audio effects that mimic natural sounds such as thunderstorms or waterfalls. Red Flower Naturally Nourishing: A Ritual of the Arctic Sea, a 100-minute experience inspired by the spirit of the icy sea with ingredients rich in antioxidants and omegas 3, 6 and 9, sourced directly from the Arctic Circle. Muscle tension is released with a deep tissue massage using Arctic berry and evergreen oils after relaxing in an organic birch mineral hydrotherapy soak. Red Flower North Atlantic Journey, an 80-minute body-exfoliating ritual with organic sea salts harvested from the Atlantic Ocean, enriched with sea algae and aloe vera, and scented with Icelandic Moonflower. The body is then enveloped in a toning and hydrating wrap of Italian Blood Orange before a restorative massage with balancing French lavender. Red Flower Japan: A Revitalizing Ritual of the North Pacific, a 100-minute, six-part massage body ritual perfected in Japan that takes the therapeutic properties of delicate flowers and invigorating citrus oils and pairs them with traditional techniques for caring for the body. The treatment begins with a ginger grass and bamboo scrub followed by a nutrient-rich rice bran wrap and acupressure facial massage. A mineral soak infused with hinoki and chlorophyll oils and a shiatsu-inspired massage creates balanced energy. Red Flower Hammam: A Detoxifying Ritual from the Indian Ocean, a 100-minute ritual of deep detoxification. Guests are vigorously scrubbed with a blend of coffee, olive stones and fresh lemons, and wrapped in a rich rhassoul clay to draw deep impurities out of the body. This is followed by a float in Dead Sea salts and a cleanse with Moroccan mint tea and silt. Then guests are recharged with a Turkish massage using essences of cardamom, jasmine, bergamot, amber and clove. The spa will extend to a private outdoor teak-deck terrace complete with partially covered lounge chairs surrounding an infinity-edge plunge pool. Adjacent to the spa will be a full-service beauty salon with four hair, two manicure and two pedicure station. Above the spa on deck six will be a fitness centre complete with free-weights, weight-lifting machines, cardiovascular workout equipment, and ample space for cycling, yoga and Pilates classes. 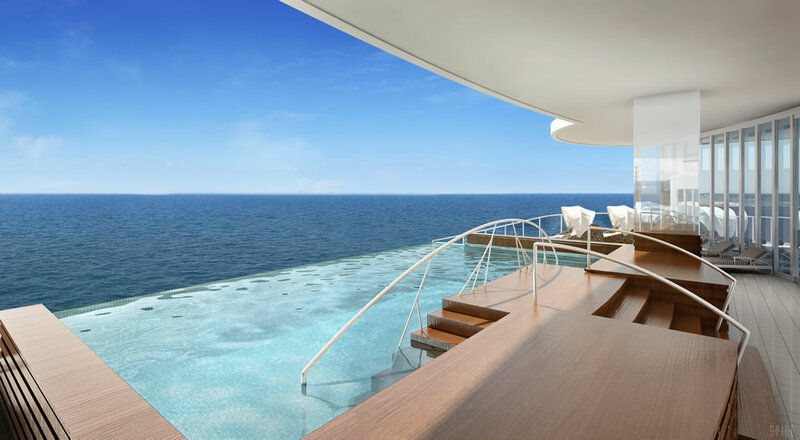 Seven Seas Explorer will sail its maiden voyage 20 July 2016 and will spend an inaugural season in Europe before heading across to Miami for a series of Caribbean voyages.